﻿ 1 John 2:6 the one who says he abides in Him ought himself to walk in the same manner as He walked. 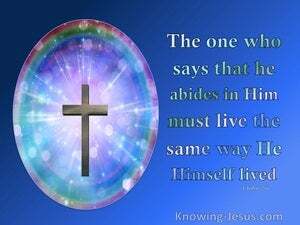 The one who says that he abides in him must live the same way he himself lived. He who claims to abide in him he also ought so to walk just as that man walked. The person who claims he is continuing to live in [fellowship with] Jesus should also live the way He did. 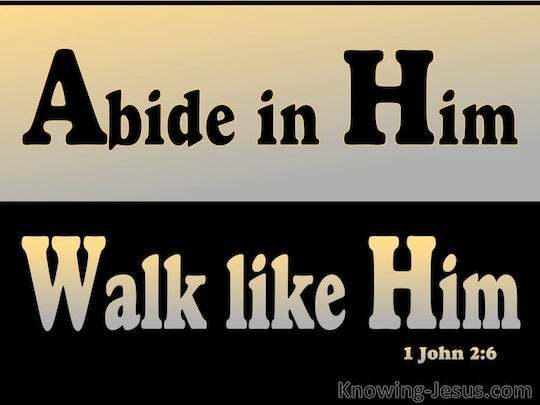 He that says, he abides in him, ought himself also so to walk, even as he walked. He who says that he is living in him, will do as he did. he who says he abides in him ought to walk as he walked. he that says he is attach'd to Christ, ought to regulate his conduct by his example. 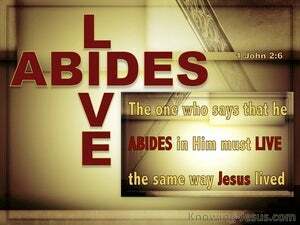 He that says he abides in him ought, even as he walked, himself also so to walk. He who says he abides in him, ought, himself, also, so to walk even as he walked. 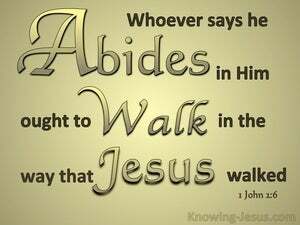 The one saying that he abides in him ought himself so to walk about, as he also did walk about. whoever says, "I am always in union with him" must live just as he lived. He that saith, he abideth in him, ought himself also so to walk, even as he walked. He saying he remains in him ought, as he walked about, so also he to walk about. The one who says [that he] resides in him ought also to walk just as that one walked. He who says he abides in Him ought himself also to walk even as He walked. He that saith he bideth in him, ought to walk even as he walked. he who says he 'remains in him' ought to live as he lived. By who says he "remains in him" ought to spend his life as he spent his. The one who says he resides in God ought himself to walk just as Jesus walked. He that says he continues in him, ought also himself so to walk as he walked. 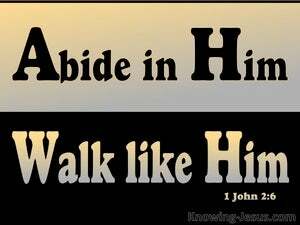 He that saith, that, in him, he abideth, ought, just as He walked, himself also, to be walking. He who saith that he abideth in him, ought as he walked, even so himself to walk. He who professes to maintain union with God is himself bound to live as Christ lived. The man who professes to be continuing in Him is himself also bound to live as He lived. Whoever claims, "I am always in union with Him," ought to live as He lived. He who says that he is abiding in Him ought himself also to walk even as He walked. He that saith, he abideth in Him, ought himself also so to walk even as He walked. He who is saying in him he doth remain, ought according as he walked also himself so to walk. 5 but whoever keeps His word, in him the love of God has truly been perfected By this we know that we are in Him: 6 the one who says he abides in Him ought himself to walk in the same manner as He walked. 7 Beloved, I am not writing a new commandment to you, but an old commandment which you have had from the beginning; the old commandment is the word which you have heard.